On Thursday, July 5, Reliance Jio made one of the most awaited announcements of the year during its Annual General Meeting. Reliance Jio announced its latest GigaFiber services which would avail broadband home services to the subscribers. The GigaFiber would facilitate speeds up to 1Gbps in the broadband segment alongside providing many smart home solutions to the users. Reliance Jio’s vision yet again is to revolutionise another industry by stepping into it head first with its competitive pricing technique. Notably, the GigaFiber is not going to be a standalone broadband internet service. Instead, it is also going to come with some interesting add-ons. The entire GigaFiber plan will consist of FTTH broadband service, Jio GigaTV, smart home accessories and a landline connection. All these services which Reliance Jio will be offering to its users will be driven by GigaFiber only. The service will avail Gigabit speeds to the users. Reliance Jio has been conducting trials with full fervour in the metro cities, now after many rounds of beta testing the telco is finally ready to launch its Fiber internet services. To bring the high-speed internet to homes, Jio is also shipping a GigaRouter which will facilitate the connection at households. Additionally, the actual launch of the services will begin on August 15. Starting then users will be able to register for GigaFiber on My Jio app and Jio official website (jio.com). Reliance Jio has said that in the first phase of rollout it would launch the services in 1,100 cities of India. Another addition to this pack of Jio’s services is the Jio GigaTV. 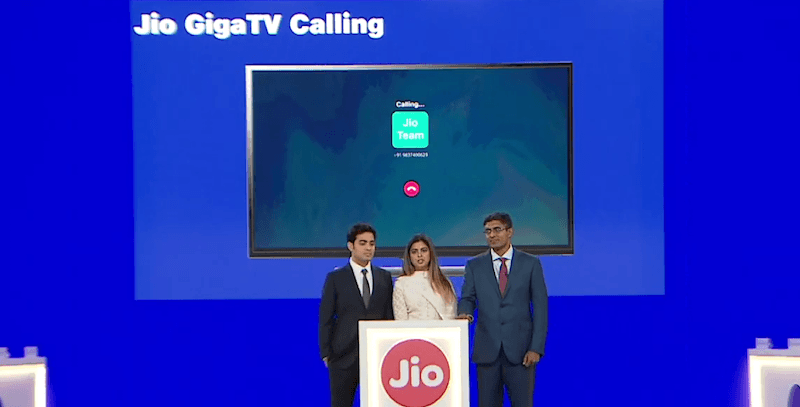 The Jio GigaTV is going to allow you to access all of Jio’s entertainment services easily by streaming them for you at high speed an on a bigger screen. The GigaTV won’t only facilitate entertainment, but it will also allow you to do the essential task such as calling someone over the network on their phone or calling other GigaTV users. JioCinema, JioMusic etc. will be through and through supported. Another striking feature of the GigaTV is going to be the voice command feature wherein you can ask the remote to play the channel or show the content you wish to watch. Not only this, but the GigaTV will also support multiple Indian languages. The entire host of services which Jio is offering will function based on its Gigabit internet connection. Therefore, Jio will ship the GigaRouter with every GigaTV purchase. However, users can also buy the GigaRouter alone as well if they do not want GigaTV services. One of the areas which Reliance Jio is going to emphasise on with its new offerings is in the field of smart home solutions. Using the new GigaFiber services, users will be able to take hold of their surveillance cameras, smart connected speakers, WiFi extenders, GigaTV, smart plugs, thermostats, door locks, various sensors for detecting events like a gas leak, and more. Jio has also promised hassle-free installation of the smart home solution devices. The telecom operator has said that the entire range of smart home devices can be installed under an hour by the Jio personnel. Also, the telco notified that shortly it might be on the plan of talking with builders to install the Jio smart home solution gadgets beforehand in homes. However, Reliance Jio has got a challenge lying ahead of itself since people are not that eager to transition to smart home products, the main factor being pricing and usability. Even then, Reliance Jio has been known to bring pricing revolutions in the country. To increase usage, Reliance Jio might also allow third-party integrations for Google Assistant in its smart home products.